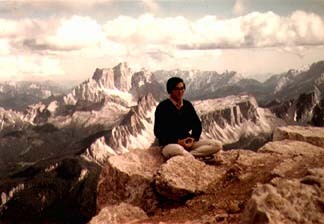 On my first trip to Europe in August 1972, I went up Mt. Lao via cable car, and climbed to the peak. The view was majestic and awe-inspiring. I sat down to meditate on enlightenment and my favorite sages. Upon closing my eyes, I saw a sky-blue circle with a golden circumference and a green dot in the center. This image came to me spontaneously without effort. Suddenly, I remembered seeing this golden-blue circle before falling asleep when I was a boy in Shanghai many years ago. But I've never seen it during my four years of meditation back then. Later, this circle reappeared while meditating at the Cathedral in Augsburg, Germany, where Leopold Mozart was born, and the young Wolfgang von Mozart had performed. I've placed portraits of seven sages on top of my meditation photo, using Adobe Photoshop. Goethe has been my inner mentor since my college days at Columbia University, when I was searching for heroes to emulate. I would encounter his eternal feminine in Lao Tzu's philosophy on the Tao, which made me appreciate the mysterious spirit of the valley, the babe and emptiness. Plato's Dialogues have taught me much about Love, Beauty, Truth, and the One. The translation of Plato from Greek to Latin by Marsilio Ficino ignited the Italian Renaissance. And Thomas Taylor's translation of Plato from Latin to English (1804) inspired the British Romantic poets. When I learned that Paul Brunton had a tanka of Chou Tun-Yi in his home in Switzerland, I encouraged my dad to translate the philosophical works of this great Neo-Confucian sage. Buddha has been a constant guide ever since a copy of Paul Carus's Life of Buddha fell off a Cornell bookshelf onto my lap. I began following the Eight-Fold Path and practiced meditation and mindfulness. Wang Yang Ming has been my favorite sage when I read about his exemplary life of courage and compassion. Dante's Divine Commedy has continually illumined my mind since attending the Dante Symposium at Cornell honoring the 700th Anniversary of his birth. The Dante lectures of Etienne Gilson, Charles Singleton, and John Freccero have inspired me to study this great poetic classic as a lifetime endeavor. There are many other sages that have inspired me in my spiritual quest for enlightenment. I'm listing them in the Sages Directory, and will include short bios, inspiring quotes, and graphical images as this web site on Wisdom Portal grows. Your comments, suggestions, and feedback are always welcome.